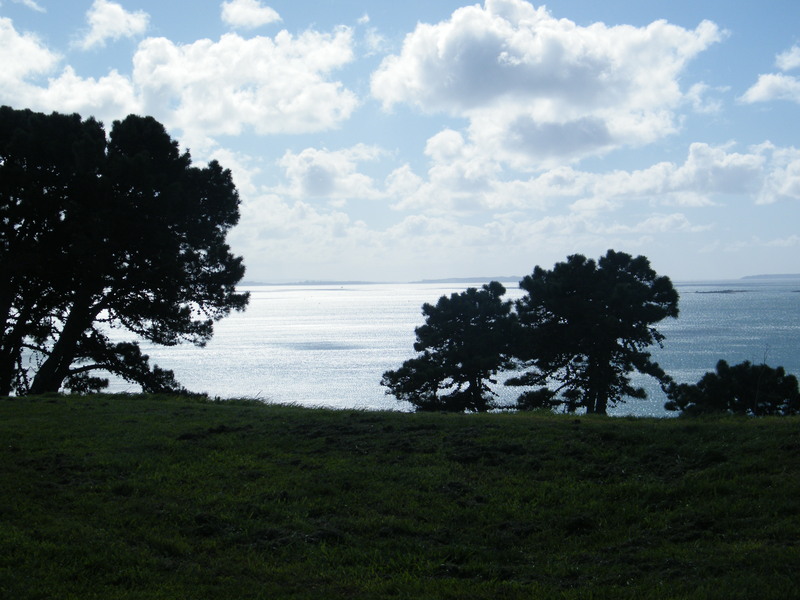 August 16 2012 dawned clear and cool in Tamaki ma Kaurau, Auckland. 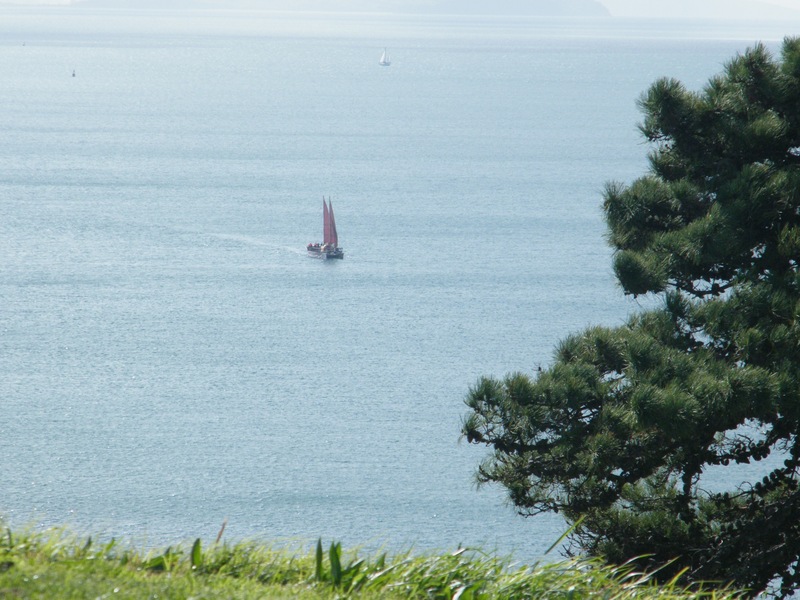 We waited on the brow of te Maunga Uika, North Head, for the first glimpse of nga waka hourua, the double hulled waka who left these shores in April, 2011. We strained our eyes against the silver hued waters of the Wai te mata harbour until to our delight we saw the first speck of the first waka hourua returning. We waited with baited breathe in fact hardly daring to breathe. Slowly but surely she came down the harbour. The excitement was palpable among the small group gathered to witness this magnificent event, the return of two of the waka hourua who began that journey as a fleet of 7 in 2011. Closer and closer she came until we could distinguish that she was Haunui and then to our delight she came in close to the headland. The voices of welcome rang out to greet them accompanied by the sound of the conch shell. A special moment in time. A re enactment in fact as this was the place that they stood to watch the arrival of waka in times long passed. Haunui led the fleet in, followed by Te Matau a Maui, Okeonas was the third waka to arrive. She is an extension of this project in that she was built to operate as a cargo and passenger vessel in the Vanuatu islands. Such is the dream for all of the Pacific Island groups, ie. to use this style of vessel as the transport systems which run efficiently on fresh air, as they do not need fossil fuels to run them. This fleet is the only fleet in the world which use this ancient technology of utilising the energy of the elements, wind, sun, stars, moon, tides, and the birds, and animals of the sea are their tracking systems so to speak. 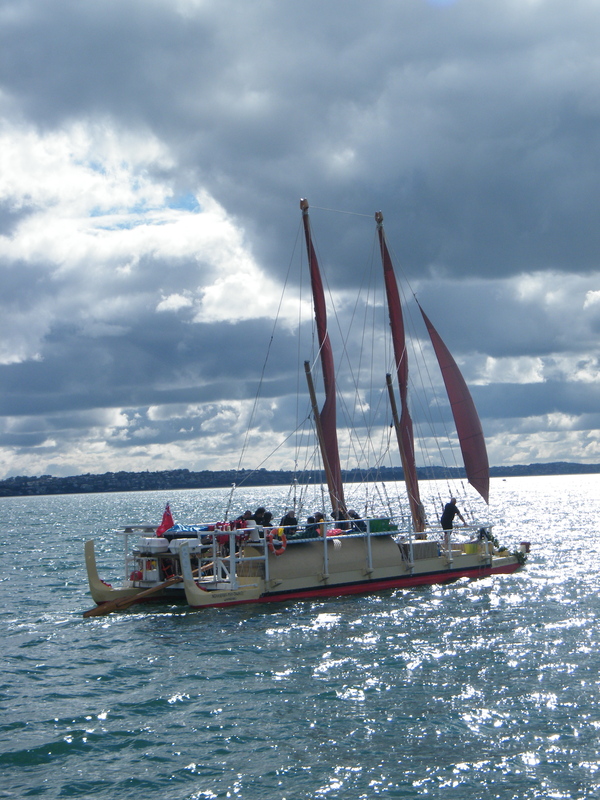 The Evahoe is the support vessel/yacht which accompanied the waka throughout the journey also sailed in with them and later that night the Tahitian waka named Fa’afetai came in. Yes an amazing feat and sadly there was not a word of it in the mainstream media, except for TV3 and they did a wonderful news item of some minutes. The waka were received with much aroha from friends and family who were there to meet them. 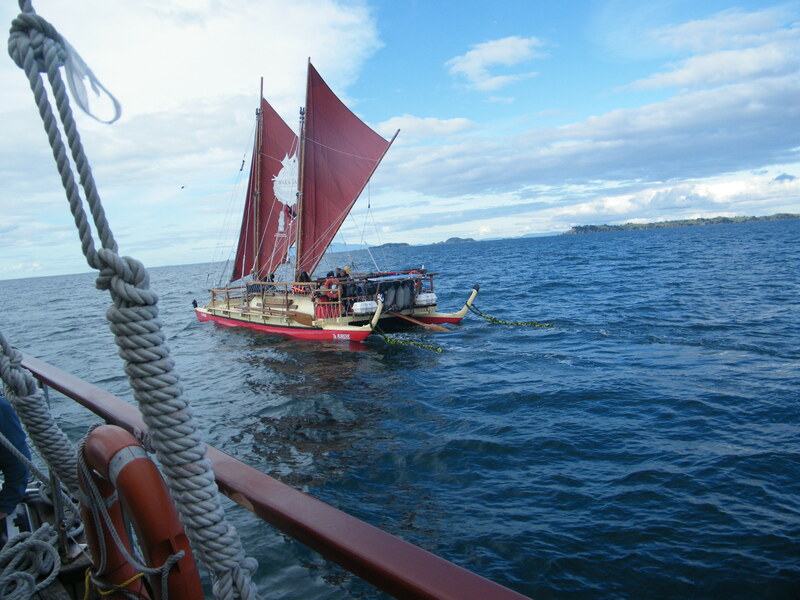 The crews of these waka wanted to arrive in time to send out another two waka hourua to Rapanui, Easter Island. So the following day we all gathered at the Viaduct to witness another historical event unfold. This has been the dream of Hector Busby who built the waka hourua , Te Aurere which has made many many journeys through the Pacific Islands, connecting and reconnecting with our relations. His dream was to sail the legge from Aotearoa to Rapanui/Easter Island thereby closing or completing the ‘Polynesian Triangle’. He built a sister ship to Te Aurere named after his late wife, ‘Nga Hiraka mai Tawhitinui. Together they set sail for Rapanui leaving August 17 after a huge send off. This voyage is called Te Waka Tapu. They are currently on the water having made their first land fall on route to Rapanui at one of the small islands of French Polynesia. Google Te Waka Tapu for regular updates of their voyage. 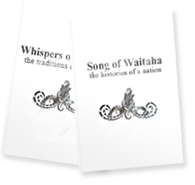 Through these magnificent projects, Te Mana o te Moana and Waka Tapu the people of the Pacific including Aotearoa are reclaiming who we are by travelling the sea trails of our ancestors. At the same time we are connecting deeply to the element of Tangaroa, the waters. With that is the responsibility of respect and caring for our waters, both within and those on which we travel. The ocean is our second breathe. We must promote the concept of caretakership of all that we do with and on the waters. Waitaha speaks of the need to keep our waters still within to be at Peace. To maintain optimum health we need to be mindful of what we eat and drink. So it is with the ocean and all waters. We are responsible for how clean the waters are. We are responsible for the food that we collect from the waters. We must keep our waters clean. We must keep the waters within the land and the oceans clean. It is as simple as that. Aroha mai, aroha atu. Love is reciprocal, flowing in and flowing out.